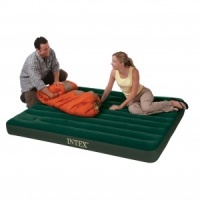 Intex Downy Airbeds with Built-in Foot Pumps. These airbeds have flocked tops to give a more luxurious sleeping surface. Their unique wave beam construction eliminates uncomfortable surface bumps and provides a flat, uniform sleeping surface. They can be inflated with either the built-in manual foot pump or a regular pump.